Multiple SSIDs are only supported in AP mode. One primary SSID and at most seven guest SSIDs (depending on model) can be configured to allow virtual segregation stations which share the same channel.Furthermore, you can enable the VLAN State to allow the Business Class AP to work with VLAN-supported switches or other devices. When the Primary SSID is set to Open System without encryption, the Guest SSIDs can only be set to no encryption, WEP, WPA-Personal or WPA2-Personal. When the Primary SSIDs security is set to Open or Shared System WEP key, the Guest SSIDs can be set to use no encryption, use three other WEP keys, WPA-Personal, or WPA2-Personal. When the Primary SSIDs security is set to WPA-Personal, WPA2-Personal, or WPA-Auto-Personal, slot 2 and slot 3 are used. The Guest SSIDs can be set to use no encryption, WEP, or WPA-Personal. When the Primary SSIDs security is set to WPA-Enterprise, WPA2-Enterprise, or WPA-Auto-Enterprise, the Guest SSIDs can be set to use any security. Business Class APs listed in this FAQ will support VLANs. VLANs can be created with a Name and VID. Mgmt (TCP stack), LAN, Primary / Multiple SSID and WDS Connection can be assigned to VLAN as they are physical ports. Any packet that enters the AP without a VLAN tag will have a VLAN tag inserted with a PVID. Step 1: As most APs, the default static IP address is 192.168.0.50. Step 2: Setup the AP with an IP Address pertaining to your Management Subnet. Step 3: Prepare your Primary SSID in the Basic Settings. 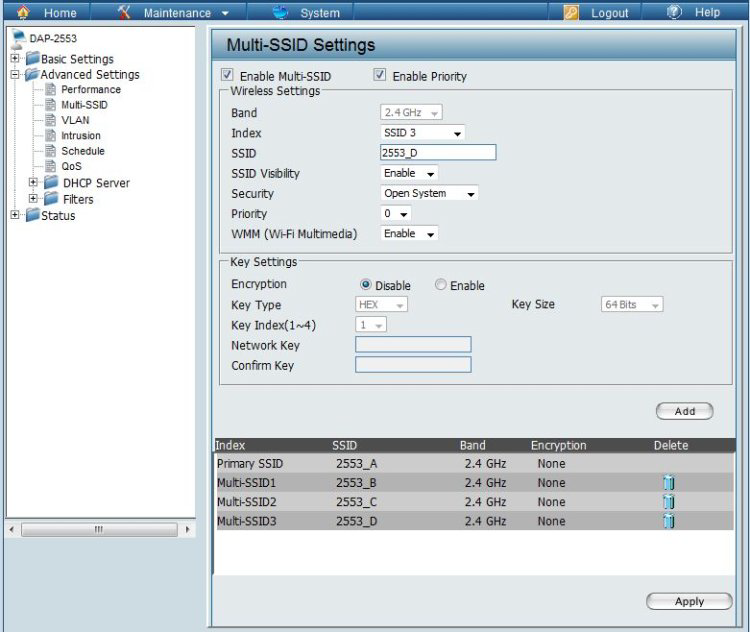 Step 4: In Advanced Settings go into Multi-SSID to enable and start adding more SSIDs. 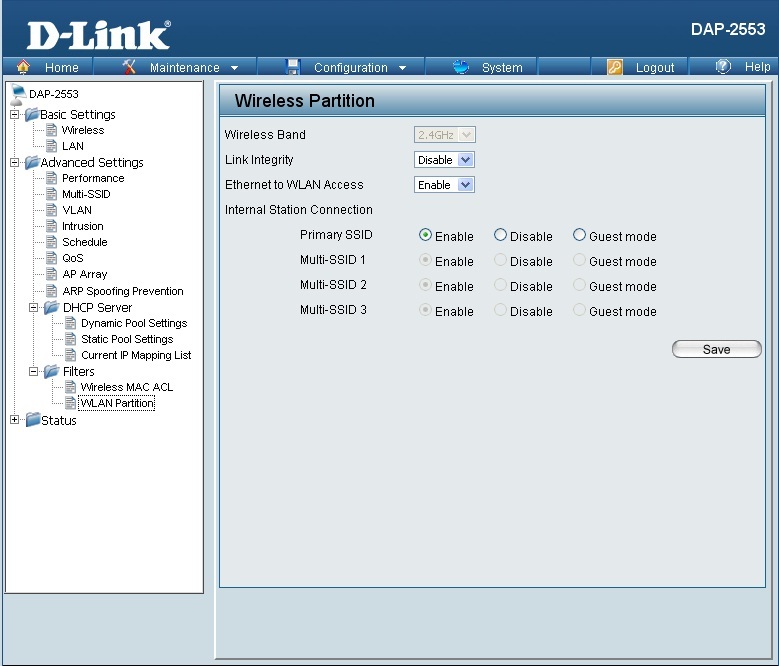 Step 5: Use the Index selection to activate the next SSID and configure the settings. Only by clicking on the ADDbutton will the next SSID be added to the AP. Add as many as you want or the amount supported by the AP from the Index list. 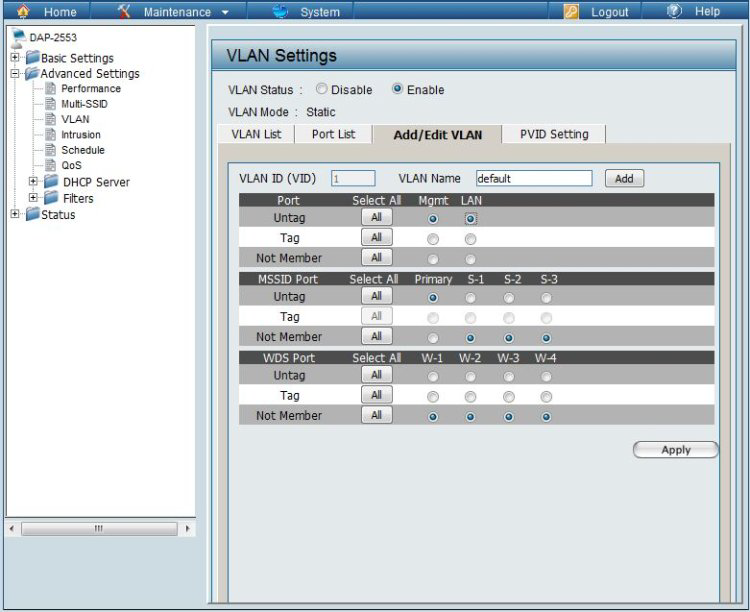 Step 6: In Advanced Settings select VLAN and Enable with the radio button. In the VLAN List, click on the edit icon to enter the default VLAN settings. 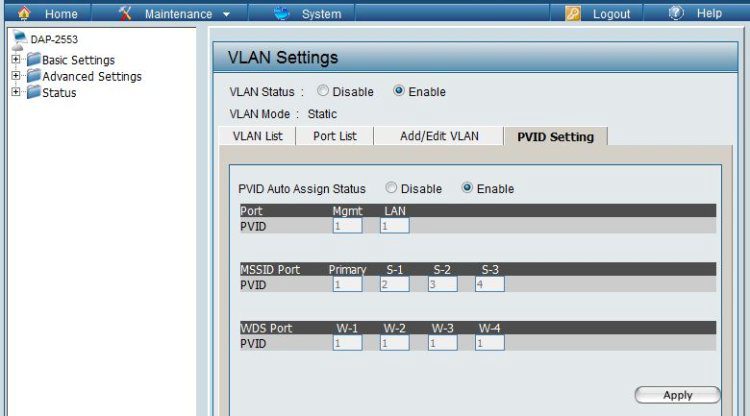 Step 7: In this default VLAN, maintain the Management and the LAN port, Untagged . Modify which SSIDs will belong to the default VLAN, though in most cases its only the Primary SSID. Once again, click on the ADD button to make the changes. 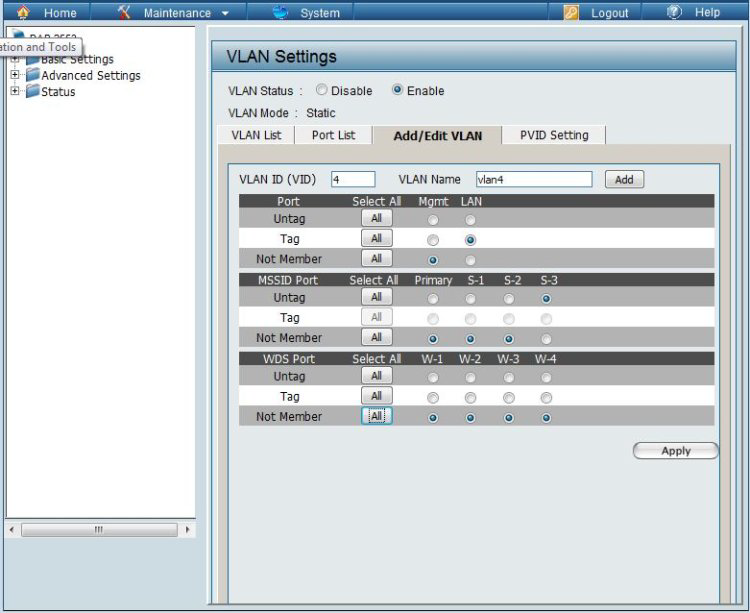 Step 8: Click on the ADD/EDIT VLAN tab, to add each of the next VLAN ID, Name and associated SSID. TheLAN port has to be Tagged but the Management port set to Not A Member. Step 9: Click on ADD for each addition. Confirm that all is assign correctly in the VLAN List. Step 10: Click on the PVID Setting tab. Preferably set to Auto Assign if single VLANs are assign to each SSID. Click on Apply to finalize. The DHCP address pool defines the range of the IP address that can be assigned to stations in the network. A Dynamic Pool allows wireless stations to receive an available IP with lease time control. If needed or required in the network, the DAP-2553 is capable of acting as a DHCP server. Dynamic Host Configuration Protocol (DHCP) assigns dynamic IP addresses to devices on the network. This protocol simplifies network management and allows new wireless devices to receive IP addresses automatically without the need to manually assign new IP addresses. 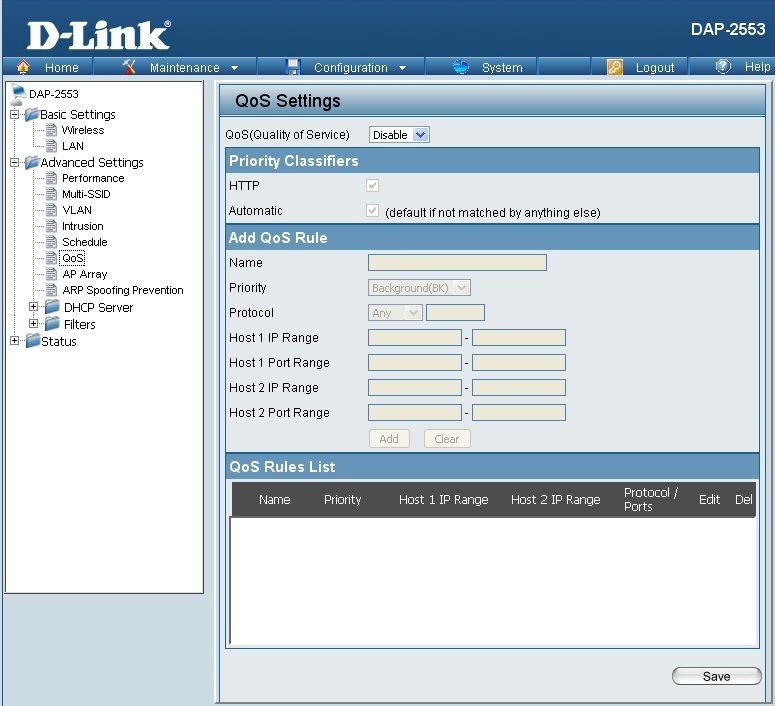 Select Enable to allow the D-Link DAP-2553 to function as a DHCP server. Input the first IP address available for assignment on your network. Enter the number of IP addresses available for assignment. IP addresses are increments of the IP address specified in the “IP Assigned From” field. All devices in the network must have the same subnet mask to communicate. Enter the submask for the network here. Enter the IP address of the gateway on the network. Specify the Windows Internet Naming Service (WINS) server address for the wireless network. WINS is a system that determines the IP address of a network computer that has a dynamically assigned IP address. Enter the IP address of the Domain Name System (DNS) server. The DNS server translates domain names such as www.dlink.com into IP addresses. The lease time is the period of time before the DHCP server will assign new IP addresses. Quality of Service (QoS) enhances the experience of using a network by prioritizing the traffic of different applications. A QoS Rule identifies a specific message flow and assigns a priority to that flow. For most applications, the priority classifiers ensure the right priorities and specific QoS Rules are not required. QoS supports overlaps between rules. If more than one rule matches a specific message flow, the rule with the highest priority will be used. Enable this option if you want to allow QoS to prioritize your traffic Priority Classifiers. Allows the D-Link DAP-2553 access point to recognize HTTP transfers for many common audio and video streams and prioritize them above other traffic. Such streams are frequently used by digital media players. When enabled, this option causes the access point to automatically attempt to prioritize traffic streams that it does not otherwise recognize, based on the behavior that the streams exhibit. This acts to de-prioritize streams that exhibit bulk transfer characteristics, such as file transfers, while leaving interactive traffic, such as gaming or VoIP, running at a normal priority. Name: Enter a name for the new QoS rule in the field provided. Priority: Use the drop-down menu to select the desired priority: Background (BK), Best Effort (BE), Video (VI), or Voice (VO). Protocol: Use the drop-down menu to choose the appropriate protocol used by the messages: Any, TCP, UDP, Both, IMCP, or Other. Host 1 IP Range: The rule applies to a flow of messages for which one computer’s IP address falls within the range set here. Host 1 Port Range: The rule applies to a flow of messages for which host 1’s port number is within the range set here when the Protocol is set to TCP, UDP, or Both. Host 2 IP Range: The rule applies to a flow of messages for which the other computer’s IP address falls within the range set here. Host 2 Port Range: The rule applies to a flow of messages for which host 2’s port number is within the range set here when the Protocol is set to TCP, UDP, or Both. Wireless Band:Displays the current wireless band rate. Access Control List:Select Disable to disable the filters function. MAC Address:Select Accept to accept only those devices with MAC addresses in the Access Control List. All other devices not on the list will be rejected.Select Reject to reject the devices with MAC addresses on the Access Control List. All other devices not on the list will be accepted.Enter each MAC address that you wish to include in your filter list, and click Save. MAC Address List:When you enter a MAC address, it appears in this list. Highlight a MAC address and click Delete to remove it from this list. 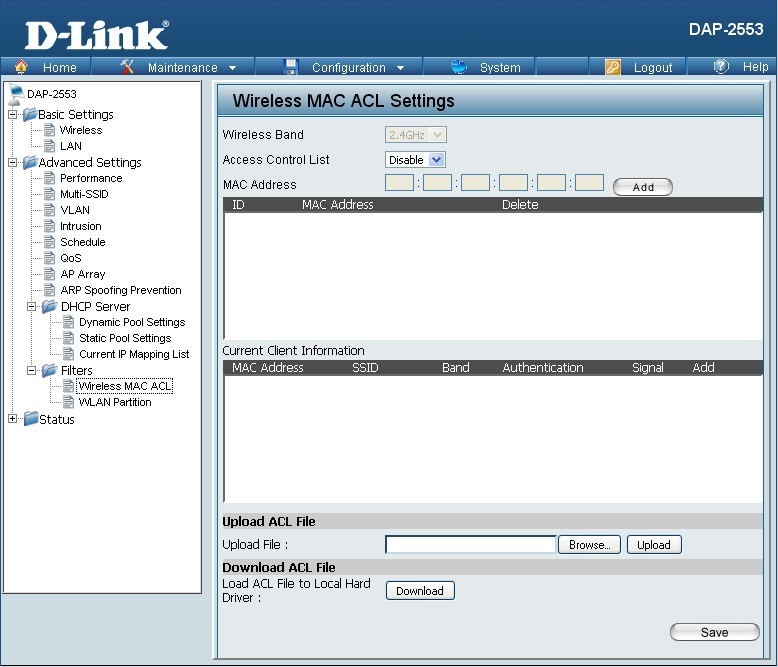 Upload ACL File:You may create an ACL list and upload it to the access point instead of manually entering the information. Once created, click the Browse button and locate your file. Select it and then click Upload. Download ACL File:Click Download to export the ACL to a file on your computer. Link Integrity:Select Enable or Disable. Ethernet to WLAN Access:The default is Enable. When disabled, all data from the Ethernet to associated wireless devices will be blocked. Wireless devices can still send data to the Ethernet. Internal Station Connection:The default value is Enable, which allows stations to inter-communicate by connecting to a target AP. When disabled, wireless stations cannot exchange data through the AP. The AP’s embedded memory displays system and network messages including a time stamp and message type. The log information includes but is not limited to the following items: cold start AP, upgrading firmware, client associate and disassociate with AP, and web login. The web page holds up to 500 logs. 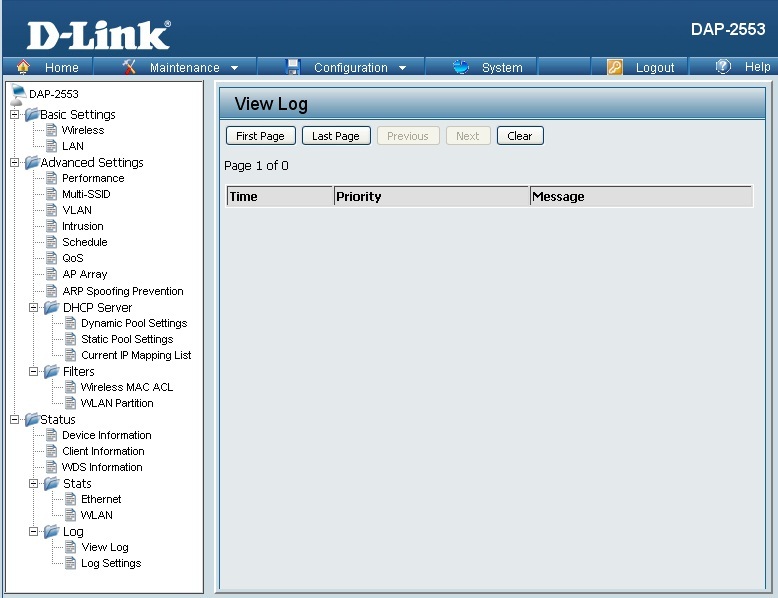 Log Server/IP Address:Enter the IP address of the server you would like to send the D-Link DAP-2553 log to. Log Type:Check the box for the type of activity you want to log. There are three types: System Activity, Wireless Activity, and Notice. Email Notification:Check to enable Email notification. 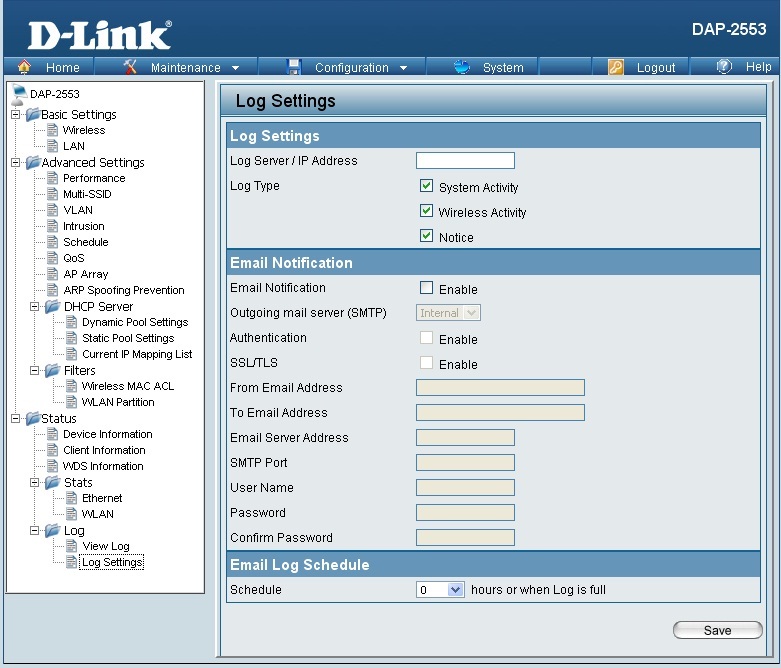 Outgoing Mail Server (SMTP):Select the SMTP server from the drop-down menu. SSL / TLS:Check to enable SSL/TLS authentication. From Email Address:Enter the “From” email address. To Email Address:Enter the destination email address. Email Server Address:Enter the Email Server Address. SMTP Port:Enter the SMTP port. Confirm Password:Enter your email password again. Schedule:Select when to send the log to your email (in hours). You will receive an email when the log is full too.